with which I went threw it. Because it is all about the journey not the destination. The number for completion and wholeness. and continue upon this life's journey..
and understanding...may all of this accumulate in Chochmah/Wisdom. HaYom Yom upon this journey. The number ten is the start of a whole new order of numbers and the culmination of the numbers that come before it. This may seem to be merely a distinction given to ten under our decimal numbering system. However the numbering systems in use in the time that the Bible was written were also based upon the number ten. A look at the number values assigned to the Hebrew and Greek letters in the table shown in the introduction Hebrew and Greek numerics will show that the letters were given values from one to ten, then increasing in tens to 100 then increasing by 100's and so on. Furthermore numbering by tens is built in to our very anatomy, count up on your fingers and when they are all used, make a mark on a piece of paper and start from your first finger again. Soon you will have a number of marks, each representing 'two hands' worth. Thus in ancient times as in modern times ten is the start of a whole new order of numbers and the culmination of the numbers that come before it. Thus wherever ten is found this completeness of order is also seen. Ten implies completeness of order, nothing lacking and nothing over. It signifies that the cycle is complete and that everything is in its proper order. Thus ten represents the perfection of divine order. Ten is the first of the triangular numbers which has a center. A triangular number is one that can be arranged into a perfect equilateral triangle. Start with a single counter (coin, marble, or indeed anything, but round objects work best). Then add a row of two under it to form a triangle. Thus three is a triangular number, but has no center. Then add a row of three under that, thus six is a triangular number but also has no center. Add a row of four underneath and we have a triangle of ten, which has a center. The central counter of the "ten" triangle is the fifth. The progression of triangular numbers continues on to infinity. It turns out that every third triangular number has a central position. However ten is the only on in which the central position is occupied by the half of the total number. Thus among triangular numbers ten is marked as unique and special. Starting with the number one, ten is the fourth triangular number. Thus ten partakes to some extent of the symbolic meaning of the number four, the number of the world. It is our natural, physical bodies with ten fingers and toes that make it "natural" to use a counting system based upon tens. Of the four "perfect numbers" (3,7,10,12) the symbolism of ten - ordinal perfection is the only perfection that natural humans can even approach. While man's perfection falls far short of Gods perfection in all things, we can strive and achieve some measure of success with ordinal perfection. We can form a perfect cube, a perfect triangle, and so on. And even if we fall short of perfection in the actuality of these things the conceptual, or mathematical perfection of such is attainable for us. We cannot aspire to divine perfection on our own. We cannot aspire to spiritual perfection on our own. We cannot attain governmental perfection without God. 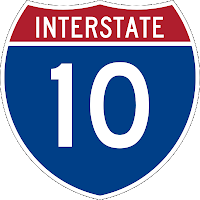 Thus ordinal perfection, as symbolized by the number ten stands out as linked with the natural, the carnal (of the flesh, as our ten fingers literally are) and the world, and yet still perfect. Ten is also a tetrahedral number. If we start with one marble and then add a layer of three marbles under it we have a perfect tetrahedron of four marbles. If we then add another layer of six marbles under that we have a perfect tetrahedron of ten marbles. Such arrangements occur naturally in atomic structure of metals and other materials. In the physical sciences such an arrangement is called "close packed hexagonal" or cph for short. You may notice that each successive layer that is added is the next triangular number of marbles. Thus tetrahedral numbers are the sums of the triangular numbers. In the same way that ten is the fourth triangular number it is the third tetrahedral number. Thus ten is linked with the first of the "perfect numbers".